Since I’m not really too into the fighting game scene, I have a lot of trouble figuring out how long the lifespan of a great fighting game should be. Mortal Kombat 9 is easily my favorite fighting game of all time. Honestly, I was ok with leaving that as my final MK experience. 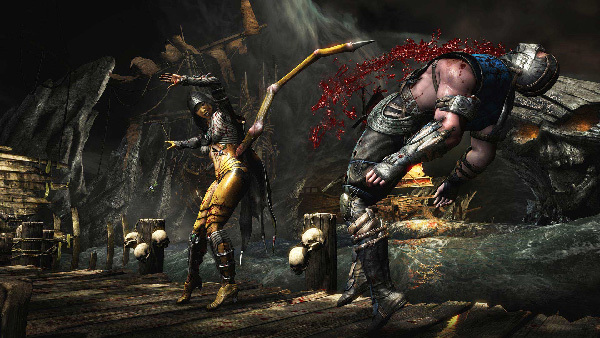 However, I really admire the confidence in which Neversoft stepped forward with Mortal Kombat X. They definitely have more to explore in the MK universe and with what I think is the most accessible fighting system this side of Dive Kick. You can’t get away with just adding a single dimensional character to the MK universe. What strikes me about the new characters is that they have a purpose for existing beyond just being the dismissive label of being “Kombat Kids.” I wasn’t as engaged in the story mode as MK 9, but this is a new story, not a retelling of over a decade’s worth of greatest hits. MKX’s story was still a must play for me. The graphical improvements and the fact that the fatalities still get reactions from gamers and non-gamers alike make everything feel like the biggest Mortal Kombat ever. I particularly liked the single-color UI for health bars, etc. It made MKX feel strikingly modern while the action itself still felt like my familiar, angry friend. I’m not convinced that you can get away with making an Mortal Kombat game without Sub-Zero and Scorpion, but MKX made more excited about the franchise’s future than MK9 did. Thanks for the additional round of x-rays, Mortal Kombat X.